Emma Hegarty wins inaugural Trans-Tasman award – the Zanda McDonald Award. 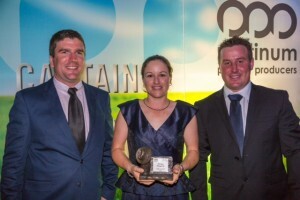 Emma Hegarty, 27 year old Beef Extension Officer for Queensland’s Department of Agriculture and Fisheries (DAF), has scooped the prestigious Zanda McDonald Award 2015. (l-r) Ben Russell, Rabobank, Alastair McDonald, Don McDonald, Emma Hegarty, Julie McDonald, Chris McDonald, Shane McManaway (PPP Chairman). The award, worth around $20,000, was presented last night at the ‘Beyond the Top End’ 2015 PPP Conference in Darwin, Northern Australia, by Platinum Primary Producers Chairman, and CEO of Allflex Australasia, Shane McManaway. An expenses-paid, tailored mentoring package whereby Ms Hegarty can spend time with three-four relevant PPP members in Australia and/or New Zealand. A place on the 2016 Rabobank Farm Manager’s Programme. Access to the 130 of Australia’s finest producers and agri-business people who make up the PPP Group. Ms Hegarty, who competed against fellow finalists; New Zealand’s Athol New, a dairy Farm Manager from Christchurch; and Luke Wright, a deer and beef Farm Manager from Te Anau, said she was humbled and overwhelmed to be the inaugural winner of such a prestigious award. Mr McManaway said Emma was tremendously deserving and that through her work she clearly displayed Zanda-like characteristics of leadership, passion, drive, ambition and commitment to her field. Zanda Award Winner and Runners Up (l-r) – Luke Wright, Emma Hegarty and Athol New. The Zanda McDonald award is a PPP initiative which aims to preserve the legacy of the late Zanda McDonald – as well as assist young agri-business people on their chosen career path. 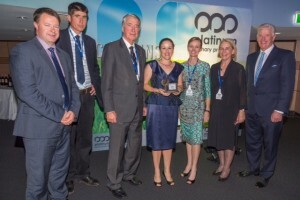 The Platinum Primary Producers (PPP) Group is a trans-Tasman networking collective that represents some 12 million hectares (25% of land ownership) and around 20 million livestock units across Australia and New Zealand.